Centerforce Dual Friction Clutch Kits are just what you need when you are looking for a new clutch for your 07-11 Jeep Wrangler JK. The Centerforce Dual Friction Clutch Kit for vehicles equipped with the 3.8L 231" V6 engine, features a pressure plate that has a patented centrifugal weight system for superior clamp load over stock and their patented ball bearing actuated pressure plate which provides light pedal effort. The Dual friction disc is equipped with segmented organic facings on both sides providing increased holding capacity. This kit includes an SFI approved, 146 tooth, 52 lb high inertia billet steel flywheel which helps the engine maintain RPM's in rough terrain. 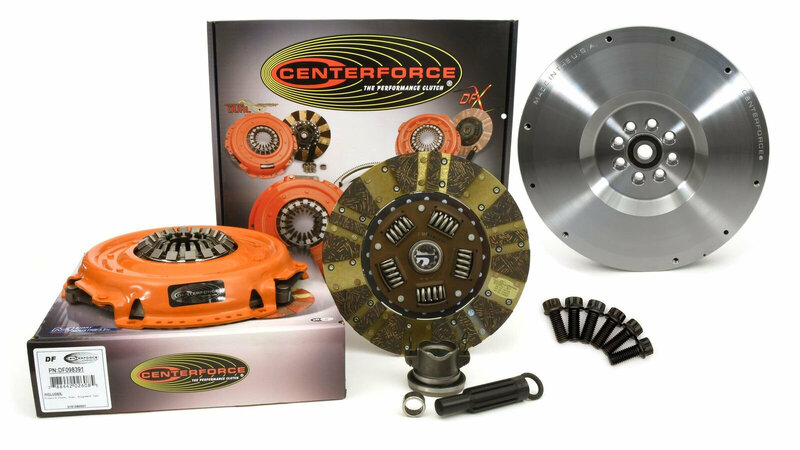 Centerforce has been a leader in clutch innovation for over 35 years and their clutch kits are engineered to perform. Engineered for Performance: Centerforce holds 9 exclusive patents pertaining to automotive performance clutches. Pressure Plate Features: The centrifugal weight system gives superior clamp load over stock and the ball bearing actuated pressure plate provides your Jeep with light pedal effort. Exceptional Torque strength holds 250 to 540 ft/lbs. Torque Strength: This unit has exceptional Torque strength which holds 250 to 540 ft/lbs of Torque. Inertia Increase: A 146 tooth, 8 bolt crank, 52lb Inertia billet steel flywheel, gives a 56% Inertia Increase over O.E. The flywheel is precision balanced to 0 in/oz. Complete Hardware: All necessary hardware and detailed instructions included for a trouble- free installation.